Plunge into a world of game delights, adventures, and fun in this unique replica of a classic matching game! Explore 4 game modes, each with its own catching qualities. You need to arrange 3 horizontal and vertical lines alike, opening presents along the way. In the game, you will find a lot of ways to collect funny animated gifts and a variety of bonuses. They came from the sea... The barbarians... Thousands of them... With only one thing on their mind... Destroy. Free your empire from barbarian invaders and become the new king. You will have to recapture all regions of the kingdom by successfully winning word battles. Calm orchestral music and detailed hand drawn graphics create an emerging atmosphere helping you relax and create your own history. 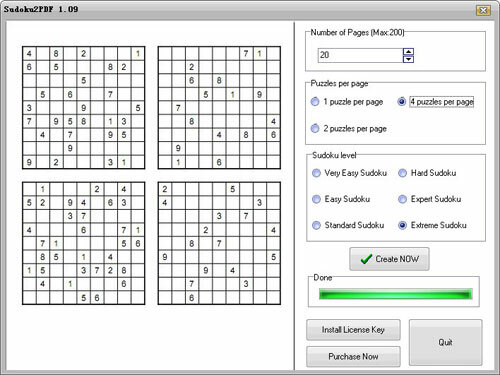 Print unlimited sudoku puzzle to PDF file,Create and personalize your sudoku ebook.With Sudoku2pdf you can print booklets of Sudoku puzzles containing 1, 2 or 4 puzzles per page.And you can select very easy,easy,standard,hard,expert,extreme level to print. Some pieces of two colors get mixed within the area. The game object is to drive the computer's pieces into the holes using the pieces of your color. Use real physical laws are combined with simple and intuitive game controls to prove your superiority. After you start a level, you can select the color of your pieces by hitting with one of them. If your pieces or none of them gets into a hole during your move, the computer makes its move. The game is played on a 15 x 15 board. The first player places a cross piece on an empty cell by turn, the second player places a null. The one who place five pieces in a row (vertically, horizontally or diagonally) first wins. In case all board is filled, and the row of five identical pieces is not made, the drawn game appears. Pieces of different color appears on the play area. Your target is get rid of them, having made one-color lines on a vertical, horizontal or diagonal. You can move any piece, if it can reach an empty seat, moving horizontally or vertically on free cells. When lined pieces disappears, new pieces don't appear and you can continue play. The lined pieces makes a score. The more long line is tne better score. Colored pieces are laid out on a game field. They form a symmetric pattern. After the beginning of party the pieces mix up chaotically. Your task to get a initial pattern. You can move a row or a column only. Any line of pieces are closed in a ring. It means, the pieces, getting out of a game field, will appear on the opposite side. Using 'Editor', you can create any patterns. Reversi are names for a strategic board game which involves play by two parties on an eight-by-eight square grid with pieces that have two distinct sides. Each of the two sides corresponds to one player, they are referred to here as red and blue. A move of the red player, for example. Red player must place a red piece on the board, in such a position that there exists at least one straight (horizontal, vertical, or diagonal) line. Ten ships of various sizes (1-deck, 2-deck, 3-deck, 4 deck) is involved in fight from each side. First, you, as the true admiral, should place your ships so, that it was difficult to opponent to find them. Further, during battle, players try to guess location of the ships and to destroy them, shooting on water area of the opponent. The ship is destroyed, if all its decks have been burnt. Additional shots accumulates after several moves. 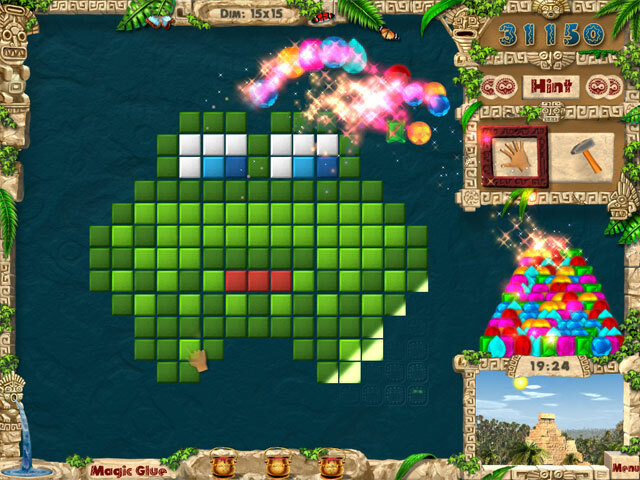 Embark on a thrilling puzzle expedition to restore an ancient Mayan temple city. Gemsweeper is easy to learn, but it will certainly put your brain to work. Starting as an expedition rookie, you set out to become a world-known treasure hunter. Gemsweeper combines fun puzzles, brilliant graphics and an engaging story into one unique, highly addictive game. Solve over 225 unique puzzles on your way to gold, gems and treasure hunting glory! High in the mountains, in a mysterious and delightful ice cave, an ancient civilization hid their treasures. Find them, by situating colored balls by fours either across, vertical, or diagonal in one of two game modes. The power of ancient treasures will help you in making the powerful combinations to reach the cave and it's many surprise treasures! Improved version of popular collapse game. You can choose your preferred game mode: when the blocks of colored cubes grow like stalagmites or fall down like stalactites. To prevent these cubes from filling the entire game screen you must burn blocks of three or more one-coloured cubes. Each further level demands you to be faster and faster. When cubes fill the entire game screen the game is over. So be attentive and quite accurate.